Soccer coaching for U10 to U12 age group! 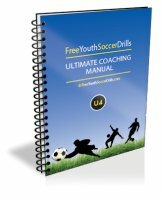 Soccer coaching this U10 to U12 drill is easy! This drill will help your players understand how to play a 'through pass' or 'through ball' to an attacking player as well as offer reminders on how to pass accurately and shoot. Take a look at the diagram below... you will need 3 cones, a few soccer balls and a goal. You should have half your players lined up behind cone A, and half your players behind cone B with one person (or the coach) as goalkeeper. - One player from cone A passes the soccer ball to cone B. - The player from cone A then makes a run (as marked out by the white arrow in diagram) round the back of cone C.
- One player from cone B then makes a 'through pass' between cones A & C (as marked out by yellow arrow). - The player from cone A should then run on to the passed soccer ball and have a shot at goal. Effectively, those behind cone A are attacking players and those behind cone B are midfield players. The midfield player attempts to make a perfect through pass between defenders whilst the person behind cone A makes a well timed run and has a good shot at goal. Cones A & C are acting as static defenders. Remember to swap around your players at cones A & B to allow everyone to both pass and shoot. If your players are becoming good at this drill, add a defender between cones A & C who tries to intercept the ball. You may need to widen the cones or ask the defender to stand in one spot at first but allow your soccer coaching skills to determine the best progression for this. You could also swap around the roles of those at cones A & B. This time the player at cone B passes to cone A and makes a run around C. The player at cone A then makes a small pass between cones A & C for the player to run on to and shoot. - Remember that it can be difficult for the player making the run to 'time' their run perfectly, it takes practice. - The same can be said for passing the ball. It shouldn't be too soft but also not too hard so it goes too far. - This drill is more about the through pass and the off-the-ball running however don't forget that a good shot at the end should be coached correctly. Leave this soccer coaching drill - see other U10 to U12 drills!